An incredible debut from Derby’s Unqualified Nurse Band as they traverse genres with ease and create a sonic masterpiece. One of the most promising bands in the UK right now unleash their debut album, hot on the heels of their sold out EP Debasement Tapes is unleashed on the unsuspecting public. The opening furore of 100 Beats sets a frantic pace that the trio maintain throughout this blistering record. Even this short instrumental is packed with excitement a garage rock overture if you will before they dive headlong into this riotous album. There is an immense multitude of sounds at play throughout the record, early hip thruster My Boots Are Shakin’ takes in a wide musical spectrum from ferocious bursts of garage rock to swaggering rock n’ roll. These bursts of rock n’ roll are fleeting as Unqualified Nurse Band indulge their heavier side in tracks like It’s Inevitable, It’s seething riffs and unrelenting power bring another wild facet to this eclectic record. Unqualified Nurse Band’s driving guitars are unstoppable every track features a wall of exquisite noise, they’re a true tour de force and they wear many of their influences on their sleeves. Two Black Eyes is certainly cut from the same cloth as some of The Black Lips best work, the thunderous drums underpinning the urgent vocals all alongside the aforementioned pulsing guitars. Similarly, though the likes of Thee Oh Sees and Ty Segall can be heard on the raucous No Peaks No Troughs, this time the guitars are brighter and the lyrics delivered with a similar intensity and enthusiasm. They close the album in an equal flourish of angst ridden guitars akin to those which they kicked things off with, but it falls upon Death Will Stalk You to provide the true highlight of the album. The chugging pace cut with an inordinate amount of expletives all delivered with furious passion, the hatred and anger pours out of this incredible track. 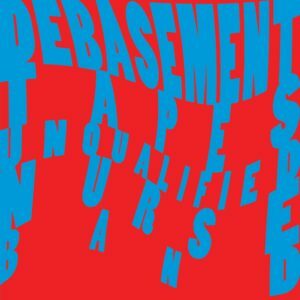 Debasement Tapes proves why Unqualified Nurse Band are one of the most exciting bands in the country, these twelve tracks coming in at less then half hour show the many facets of the band. From their swaggering rock n’ roll their riff laden heavy rock to their incredible garage rock it has it all, a truly wonderful record. ~Unqualified Nurse Band can be found online here unqualifiednurseband.wordpress.com. They’re also on Facebook and tweet as @UN_NURSE.